I have built a number of different nest boxes over my years as a poultry keeper, some more successful than others. Too small and they won’t use them or you will get broken eggs, too big and they won’t use them or they will scatter the eggs, too high and they will roost in them, the list goes on. All of them have had red mite take up residence in the cracks at some point and most of them have had broken eggs in them where a clumsy chicken has trodden on a slightly thinner shelled egg or two. Broken eggs can be a real problem in the coop since the birds soon get a taste for them, which leads to chickens breaking and eating eggs, a vice which can be difficult to stop. When I heard about the Chick Box, a new plastic injection moulded nest box system that incorporated a roll away egg tray, I was eager to try it out to see how it compared to my own DIY efforts in wood. The Chick Box nest boxes are self-contained that only require screwing to the wall of the hen-house or onto a wooden frame. They cleverly link together so a group of boxes may be attached to one another in a group. They have a landing bar or ‘perch’ at the front of the box that folds up to close off the box or to provide access to your eggs that are collected in the roll away egg tray. The roll away egg tray is an excellent idea. I haven’t used one of these before and it took a little encouragement to get the girls to lay in there with their usual nest boxes still available. I closed off their usual nest boxes and followed the advice on the Chick Box website, adding straw initially, (which is what my hens are used to laying on) then slowly removing it once they were laying in the new Chick Box. They soon got the hang of laying in the roll away tray and my eggs are kept clean and intact, for me to collect later in the evening when I get home from work. What I liked the most about the Chick Box is how it comes apart so easily for cleaning. There is one slider that removes the front and the roll away tray slides out, allowing easy cleaning of smooth plastic surfaces inside. There is certainly no place for red mite to hide, which is a major advantage over the more common, wooden nest boxes I use. 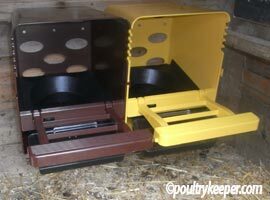 There are currently two colours of Chick Box available: yellow and brown. Personally, I preferred the yellow at first but after having it installed for a couple of weeks, I have found the brown box doesn’t show the dirt as much as the yellow. It takes me about a minute to take both boxes apart and clean them with a damp cloth, which is far faster than cleaning out my old wooden nest boxes. I have been very pleased with the Chick Box and I think it is an ideal solution in the continuing fight against red mite. At around £40 or so, I don’t feel the price of the Chick Box is unreasonable, especially considering the money that I seem to spend on red mite treatments every year! There are only a few companies selling the Chickbox in the UK, I haven’t seen them for sale in the U.S yet. You can buy a Chick Box by clicking on the image.